Ah poor old Arsene Wenger. His grand plan to fashion a shiny new, post-Invincibles team from cheap, cheerful and young talent rather than big tim Charlies seems to be failing yet again. After being thoroughly outclassed by Bayern Munich on Tuesday night, the north Londoners’ hopes of Euro success are all but dead and buried now. 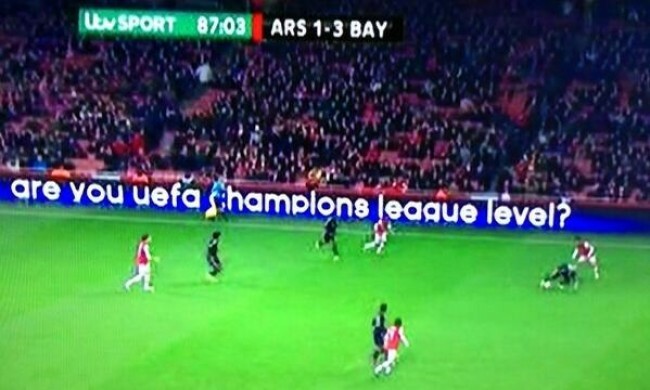 And to make matters worse, in the advertising boards at the Emirates and starting to question the club’s French boss. Zut alors! If I was a betting man I would have gone for a goal down inside 10 mins. So often in big games this season they concede early. To be honest I’m getting sick of feeling pity for Arsenal. It used to be that teams feared Arsenal and fans hated them. Over the past few seasons I’ve almost adopted the kind of feeling towards them that I do when seeing a lost puppy. This made me laugh until my sides hurt. Well done, marketing dept! @jules, just because Arsenal got VERY lucky in the group stage doesn’t mean they’re better than City. Sure City shoul’ve done better but they had a Group 10 times more difficult than Arsenal. That being said, I don’t think many teams can compete with this Bayern, only Barça and maybe Real. And with already 15 points over 2nd place in Bundesliga, they are again serious contenders for the Champions League title. THAT is what I’m talking about. You lost at home against 3rd place Bundesliga last year (currently 9th), while City had to face the league champions (current 2nd). You also faced the french champions, but who currently are 8th in their league (and you bought Giroud off them). City had to face Real Madrid, also very difficult, although they should’ve won against Ajax (champions last year, currently 2nd). So you can’t say Arsenal is “more CL material” just because you were luckier.